Liam Teague observes that for steelpan players “there is no denying that there are tremendous benefits to learning music by ear.” He contends, however, that “the ideal system of learning music should be one that couples both the rote and [the] so-called formal way of learning.” “It would eliminate the ‘guessing game’ that often occurs with pannists who are not familiar with even the basic rudiments of music”. A review by Liam Teague, Assistant Professor of Music & Co-Director Northern Illinois University Steelband. 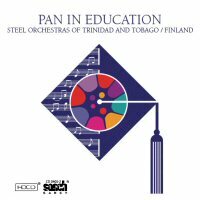 The “Pan In Education” project provides a number of beneficial educational tools that without a doubt, will significantly impact the development of the Pannist of the future, and, by extension, the growth of the Steelband. In very recent times, the pannists’ exclusive dependence on learning music by rote has been slowly but surely losing it’s appeal, and many steelpan players are beginning to embrace a more formal and structured approach. There is no denying that there are tremendous benefits to learning music by ear. From a personal standpoint, the early exposure to ear training in the panyards, did wonders for me when I embarked on my initial studies at Northern Illinois University. Those aural skills exams that have come to be so feared in educational institutions the world over were not as intimidating as they could have been, thanks to the lessons learned in the panyard. Additionally, the retention skills that many of Trinidad and Tobago’s pannists possess, is arguably, unparalleled in the world of music. Yet, I have come to realize, more and more, that the ideal system of learning music should be one that couples both the rote and so-called formal way of learning. While it is an amazing feat that so many of our “unschooled” arrangers can produce many works of great intricacy, I believe that the process of turning out more of these talents can be expedited if the “guessing game” that often occurs with pannists who are not familiar with even the basic rudiments of music from an early age, could be usurped with a more direct and structured music education. I have often observed that the Steelpan arranger is many times revered as a musical God in the panyard, when in actuality he or she may really just have an understanding of the theory of music no higher than a sophomore music student in college. Of course, this statement should not in anyway be seen as an effort to discredit the rich and wonderful natural talent that exists in our country, but should be viewed as reinforcement to the notion that if that raw promise were blended with exposure to music education, even higher levels of musicianship could be attained. “Pan in Education” appeals to musicians of varying levels. Regardless of if one has only an elementary understanding of playing the instrument, or has been playing since “Corbeaux Jack” was a boy in short pants, this program can be relevant. While all of the compositions are by one composer, Mark Loquan, each composition is varied enough so as not to allow any sort of predictability to step in. Such stalwarts as Jit Samaroo and Pelham Goddard have contributed arrangements; while at the same time some of the young lions like Seion Gomez, Kareem Brown and Amrit Samaroo have an opportunity to have their voices appreciated as well. It is rather refreshing to know that the project provides students of the art form with a structural analysis of each arrangement, and they in turn, can use their eyes to hear and assimilate varying approaches to modulation and/or orchestration. Indeed, this opportunity to look into the sometimes very private and guarded musical world of a Steelband arranger is invaluable. Of special significance is the inclusion of a biographical link. In the world of Jazz, musicians would be laughed at and chastised if they did not have so much as a basic understanding of the contributions of Charlie Parker, Thelonius Monk, John Coltrane et al. Having traveled as a soloist and clinician to many educational institutions in Trinidad and in the USA, I am often surprised at how unfamiliar instructors and students are with respect to the pioneers of the Steelpan, and what strides are being made, or not being made for that matter, in the contemporary Steelband world. Excerpts of the original vocal versions of the songs are wisely included. Many arrangers will testify that the lyric of a song acts as a strong influencing factor as to the direction a Steelband arrangement takes. Analyses of the level of difficulty of the various arrangements is included in the package and also present are suggestions of what lessons can be learned from the arrangements e.g. how to modulate, familiarity with key centers, musical form. Once again the designers of the program took great pains to insure that education in a variety of facets was a priority. It would be of some value, I humbly suggest, that in addition to the marvelous existing product, follow up versions of this program could include compositions by more than one composer and also explore pieces outside of the calypso idiom (maybe an approach to arranging classical music, transcriptions, Indian musics, etc). There exists a degree of sameness as to the structural direction of the arrangements i.e. intro, melody, variation, jam, outro, that could breed a sense of conformity rather than creativity.